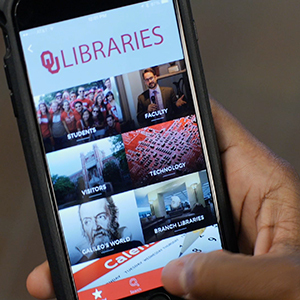 Patrons at the University of Oklahoma Libraries can now navigate the system's collections, exhibits and campus landmarks via smartphone. The university has deployed Aruba Beacons and the Aruba Meridian Mobile App Platform to create the OU NavApp, a mobile app that provides turn-by-turn directions, location-based information and educational content to help students, faculty and visitors find their way through the seven-floor, 400,000-square-foot library system. After testing the technology in the library's Peggy V. Helmerich Collaborative Learning Center, the university expanded the deployment to the entire OU Libraries system as well as other popular campus spots such as The National Weather Center, Fred Jones Museum and Sam Noble Natural History Museum. The OU Libraries' extensive facilities can be complicated to navigate, noted Emerging Technologies Librarian Matthew Cook in a statement. "It's an intimidating building, especially for first-time users, which include many of our incoming freshmen, and it's a bit obscure. The resources and services are not immediately apparent when you walk in the front door," Cook said. "With the beacons and mobile app, we can now leverage the technology that's already in our freshmen's pockets — their mobile devices — to combine the offline and online experience and guide them between resources." Available for both Android and iOS, the NavApp is organized by type of user, so that students, faculty or visitors can access the information and resources most relevant to them. The app provides a map and turn-by-turn navigation for every publicly accessible area, guiding users to library resources, gallery exhibits, restrooms and elevators. It can provide users with disabilities the easiest route to elevators, or guide users to the safest location during a storm. "Beyond the obvious convenience and efficiency the app brings our users, there's a safety and security element as well," said Cook. The university plans to monitor the number of users downloading the app and look for further opportunities to expand the deployment.